"Mummy lets make butterfly cookies" the Pose asked one Sunday while we were eating lunch. "Ok Pose, if you are a good girl and eat all your sandwich we can make cookies" I lovingly replied. That's a verbal contract in my book. She didn't eat her sandwich. Not the end of the world I grant you but with the current battle-of-wills-Mexican-style-stand-offs we have begun enduring as our little person demonstrates she has indeed inherited both her father's AND mother's stubborn-must-always-get-my-own-way-nature, I was determined to stick to my guns (ah the sweet sweet irony). Within an hour I was feeling bad about it. I had been away on the Thursday night for a biz trip and was departing for another 4 days on the Monday and wanted to have a nice Sunday with Posie. I had also decided that it would be nice to leave something baked for them to eat while I was gone. Plus muffins aren't cookies right, so I technically still won this battle (at least I'll keep telling myself that). We all love blueberry muffins so it seemed logical that I'd make those to leave as a token of my love for my little family (ahhhhhhh). Now here's where I admit that I've never made blueberry muffins from scratch. Don't get me wrong, I've made them before but with a little help from Betty Crocker! We have a little shop at the end of our road and they always have blueberries so we popped down to pick up a punnet. Except they didn't have any today. Le Pose spotted strawberries and bright little thing she is, suggested strawberry muffins. 1. Preheat oven to 425 degrees F (220 degrees C). Grease 12 muffin cups (I just put muffin/cupcake cases into muffin tins, I didn't bother with the oil). 2. In a large bowl, mix flour, oats, baking powder, baking soda, cinnamon and salt. In a separate bowl, whisk together egg, milk, olive oil and sugar. Mix in strawberries. Stir strawberry mixture into oat mixture just until evenly moist. Spoon into prepared muffin cups. 3. 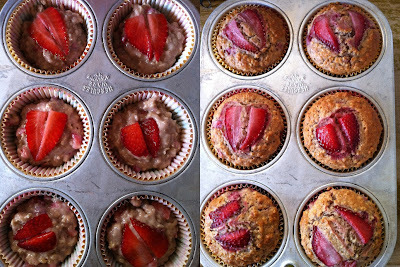 I then thinly sliced some strawberries to use for decoration and carefully pressed a slice into the top of each muffin. 4. Bake 18 to 20 minutes in the preheated oven, until a knife inserted in the center of a muffin comes out clean.